1600 satellites were sent up by a country for several purposes. The purposes are classified as broadcasting (B), communication (C), surveillance (S), and others (O). A satellite can serve multiple purposes; however a satellite serving either B, or C, or S does not serve O. The following facts are known about the satellites: 1. The numbers of satellites serving B, C, and S (though may be not exclusively) are in the ratio 2:1:1. 2. The number of satellites serving all three of B, C, and S is 100. 3. The number of satellites exclusively serving C is the same as the number of satellites exclusively serving S. This number is 30% of the number of satellites exclusively serving B. 4. The number of satellites serving O is the same as the number of satellites serving both C and S but not B. 1600 satellites were sent up by a country for several purposes. The purposes are classified as broadcasting (B), communication (C), surveillance (S), and others (O). A satellite can serve multiple purposes; however a satellite serving either B, or C, or S does not serve O. 1. The numbers of satellites serving B, C, and S (though may be not exclusively) are in the ratio 2:1:1. 2. The number of satellites serving all three of B, C, and S is 100. 3. The number of satellites exclusively serving C is the same as the number of satellites exclusively serving S. This number is 30% of the number of satellites exclusively serving B. 4. The number of satellites serving O is the same as the number of satellites serving both C and S but not B. What best can be said about the number of satellites serving C? What is the minimum possible number of satellites serving B exclusively? If at least 100 of the 1600 satellites were serving O, what can be said about the number of satellites serving S? If the number of satellites serving at least two among B, C, and S is 1200, which of the following MUST be FALSE? It is given that the satellites serving either B, C or S do not serve O. 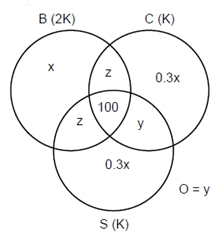 From (1), let the number of satellites serving B, C and S be 2K, K, K respectively. Let the number of satellites exclusively serving B be x. From (4), the number of satellites serving O is same as the number of satellites serving only C and S. Let that number be y. This number will be maximum when y is minimum. Minimum value of y is 0. Therefore, the maximum number of satellites serving C will be 725. Maximum value of y is 110.
number of satellites serving C.
The number of satellites serving C must be between 450 and 725. This is minimum when y is minimum. Minimum value of y = 0. The minimum number of satellites serving B exclusively = 5 × 0 + 250 = 250. Given that at least 100 satellites serve 0; we can say in this case that y ≥ 100. Minimum number of satellites serving = 725 – 2.5 ×100 = 450. This is maximum when y is minimum, i.e., 100 in this case. No. of satellites serving B = 2k = 2  725 = 1450.